Now that the holiday season is over, Dydacomp will resume the update schedule in which our developers will provide important M.O.M. enhancements and bug fixes in a M.O.M. update every two weeks. These updates are targeted to help improve Multichannel Order Managers functionalities from order entry to inventory management. The newest bi-weekly executable is now available for download on the support section of our website and is the first M.O.M. update for 2012. Within this release, we have made some minor enhancements and a number of fixes for supported M.O.M. users that the Dydacomp Development team has been working on over the busy holiday season. Enhances the synchronization between Blackthorn/eBay and M.O.M. The holiday season has kicked into high gear and online measurement firm ComScore reports that holiday season eCommerce spending during the first 34 days of the holiday shopping season is quickly approaching $20 billion. Comscore also reported that this is a 15% increase in eCommerce spending compare to the same time period in 2010. Dydacomp Support team is on standby to help ensure the success of your business during this busy time. It’s highly recommended that you backup your M.O.M. systems as often as possible to ensure the integrity of the data during this busy holiday season. Also, make sure you test the backup version to verify that it contains a full working copy of the entire MOMWIN folder. For more information on how to backup your M.O.M. system, visit this blog. I also wanted to bring up an important feature in M.O.M. that is often unutilized by many M.O.M. users. M.O.M. 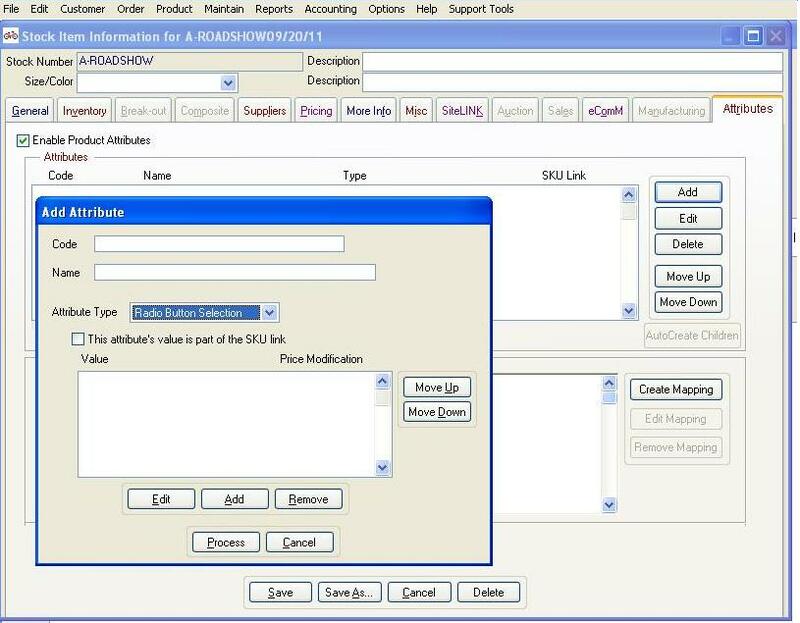 provides your business the ability to assign and manage Product Attributes in both your SiteLINK eCommerce store and your Multichannel Order Manager System. 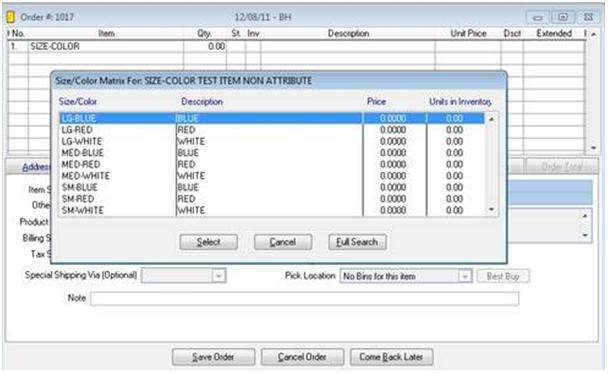 If set up properly, product attributes provide a simple way to setup size/color items. Once set up, these features help to improve the quality of your website and facilitate the customer’s ability to order the product that fits their needs. They will also enable you to improve your inventory management efficiency which will contribute to the overall improvement of your order management processes. Product attributes also allow you to create drop down menus and radio button selection options for your size/color choices to make it easier to select which attributes you want listed on your site. 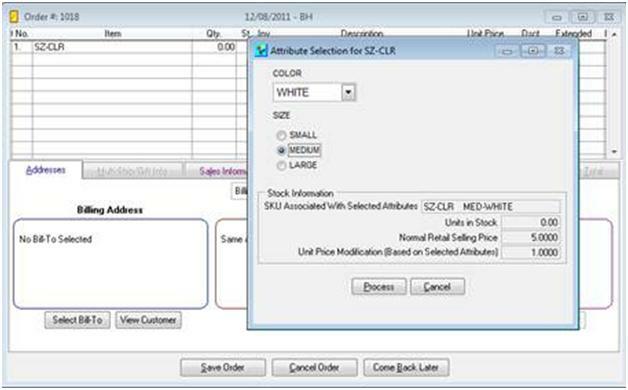 Product Attributes enable you to keep all size color products at a base price and then modify items to change any unit price. These features can enable you to cut your product setup time in half. Hope this helps to improve the management of your M.O.M system during this busy time of year. If you have any questions please contact support at 973-237-0300 or online at the support section of the website. The latest bi-weekly release for Multichannel Order Manager is now available for download on support section of our website. A new field as been added in the Misc tab of a stock item to allow information to be written to a custom field that will be passed to Endicia for customs information for international shipping. A change has been made to the box ID barcode so it will be readable by HarveySoft CPS. A new tab has been added on the line item extended information screen to display the special pricing an item is eligible for. For a full list of the enhancements and fixes in the update please visit the support section of our website. To help ensure a successful holiday shopping season, the Support team has compiled a few tips to help ensure the stability of your M.O.M. system. We recommend that all M.O.M. users should have a backup procedure already in place. The best practice to start implementing, especially in this busy holiday season, would be to schedule backups on a daily basis. If you do not already have a back-up routine in place, check out this blog or this user forum article for tips. To take advantage of M.O.M’s front-end ability to bring up records in larger tables, we recommend a database re-index routine should be run on a scheduled basis. Due to the fact that database re-indexing requires exclusive use of the system (only one user being logged into MOM), some users only run the re-index when asked by Dydacomp support. As the holiday season will result in a steady increase in data entered into the database, a re-indexing schedule should be run on a weekly or bi-weekly basis to ensure the stability and success of your M.O.M. system. A backup should also be made prior to re-indexing the database. 3rdparty vendors that integrate with your order management system (ex. Blackthorne, ShopSite, Miva, etc.) may introduce database changes in their upgrades that the Dydacomp may not be aware of. Some Windows Updates are also known to make unexpected changes to your operating systems. To best avoid a disturbance in your daily order entry and processing cycles during the holiday season, it is recommended that you wait to make any 3rd party updates until January 2012. If you have any questions or have trouble updating, Dydacomp Support is available Mon–Thurs 9am to 6:45 PM EST and Fri 9am to 4:45 PM EST by calling 973-237-0300. You can also contact Support via the online ticketing system by clicking here. Today the newest bi-weekly executable is now available for download on the support section of our website. Within this release, we have made some minor enhancements and a number of fixes for supported M.O.M. users. Update for M.O.M. & Sitelink integration to respect shopper’s Ship-Ahead selection, except in cases where you have set up to dis-allow Ship-Ahead on a global bases. Update for the USPS bar code label. Resolved the 107 error when performing a customer look-up via the phone number field. Increase in the catalog code fields for smoother importing. In addition to the above, we have also added a new global flag to serve as a work around with some of the rounding issues that you may have experienced when attempting to reconcile Accounts Receivable. Customers now have the ability to set a global parameter to allow you to round your line items extended price to either 2 or 4 decimals. This toggle impacts only new order and open orders that have not been invoiced or shipped (including multiple shipping, and ship-ahead orders). Once the toggle is set, the entire order total and the payment amount of the order will be calculated based on the rounding that is selected. Please note, this toggle will not change any orders that have already been shipped or invoiced and the order total can differ depending on the level of rounding that you select. For a full detail of the fixes included in the update please log into Dydacomp Support Online. Due to continued flooding in the wake of Hurricane Irene, more roadshave been closed leading to the Dydacomp headquarters in Totowa, NJ. Dydacomp’s office will continue to operate today Wednesday 8/31/2011, with a skeleton crew at our headquarters. They will be supported by many of our Support team members that are working from home. Our goal is to respond to and resolve all support tickets at normal levels, but customer’s with critical issues such as down systems remain the priority. Less critical issues will be responded to as soon as possible. We will keep you posted and inform you of Dydacomp’s status as it changes. We appreciate your continued understanding and patience this week. Dydacomp Sales is available and will continue to return voicemails today. Access to report all Support issues online or by phone by calling 973-237-0300 is still fully operational and we will do our best to address all of them as soon as possible. Thank you again for your continued patience and understanding. Did you catch the training webinar on backing up Multichannel Order Manager held on Thursday March 24? If you were unable to attend the webinar, but still wish to view the slides and webinar you are in luck. We have placed a link to a PDF of webinar on our M.O.M. User Forum and the webinar recording is on the support section of the Dydacomp site. The importance of backing up your system. Unforeseeable events can cause data loss and data corruption. Without a back up to restore from, you lose all your data with no chance of recovery. This webinar covers VFP and SQL backends. Let us know your thoughts on the webinars by commenting below! Stay tuned for more Multichannel Order Manager and SiteLINK eCommerce webinars in the coming weeks! Do you know that the most effective way to get a support issue resolved by a Dydacomp technical support representative is to log your Support ticket on our online system? This will help us handle and track your issue more efficiently and effectively than if you email a Support rep directly or even email the support mailbox. This online ticketing system was created to help our Support representatives respond to your issues in a more organized manner. Support reps are required to handle tickets assigned to them through the boarding system making the ticketing system the most effective way to report your issue. By following our Support ticket protocol, not only are you helping our Support reps here at Dydacomp answer and respond to tickets faster, you will also benefit. 1. Our Support reps here are people too (I know, we all like to think they’re superheroes). By following the ticketing procedure, you will avoid the lag time that occurs when you directly email a Support technician who is out for the day or is devoting time to another client issue (such as a system down). This will ensure that your issue is dealt with as soon as possible and is not sitting in an individual inbox waiting for an answer or in the support box. When you email the support box, you increase your wait time as a support rep has to take the time to copy the issue and paste it into the online ticketing system before it can even be assigned to a rep.
2. Our Support department is organized and staff is assigned based on his/her skills and expertise. Therefore, when you enter a ticket online, Support management has immediate visibility and can assign it to the appropriate resource. This helps us make sure your issue is given to the right expert the first time around; if you email a specific representative they might not be the best person to handle that particular issue which can result in a longer wait time for resolution. If you need some guidance on how to use the online ticketing system, check out this webinar Chris Lang hosted explaining how to use it. Have a question or comment, don’t forget to comment below!